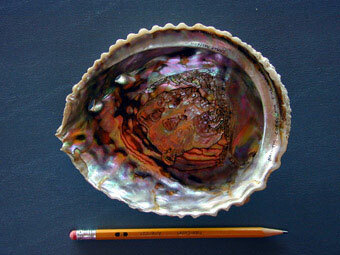 Seven species of abalone can be found on the West Coast of North America (red, pink, black, green, white, pinto, and flat). 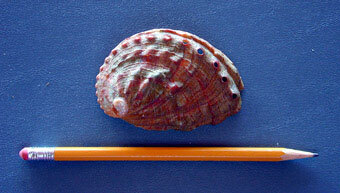 Note that the pinto and threaded abalone were once considered separate subspecies. 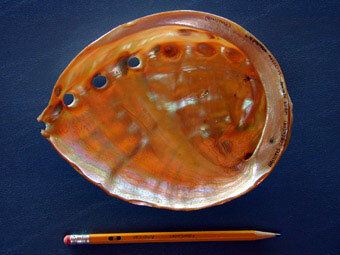 Abalone species ranges on the West Coast of North America. 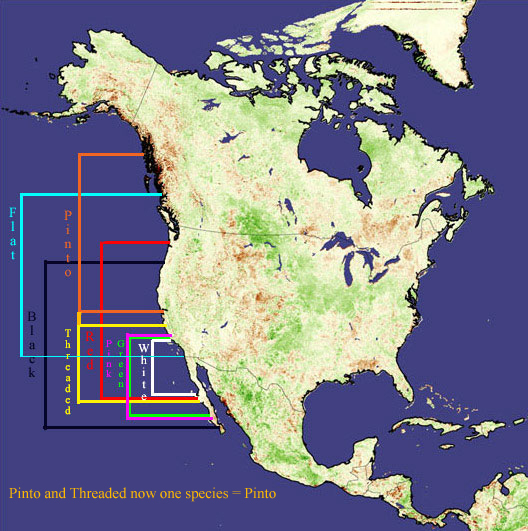 The pinto and threaded are now considered the same species but with a northern and southern shell form that integrates in the area of Central California between the ranges shown in this map. (Map from NASA, ranges added by author (GA) indicating each species' general concentration, not full range.) Visit Daniel Geiger's wonderful ABMAP site for the most recent geographical and scientific information at: http://www.vetigastropoda.com/ABMAP/text/worldmap.html . Abalone have been used in this area since man was first here. The native Americans ate the abalone meat, used the whole shells as bowls, pieces of the shells for fish hooks, scrapers, beads, necklaces and decorations, and even bartered with the shells. 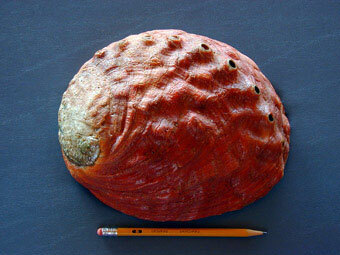 Red abalone, Haliotis rufescens, are the largest abalone in the world, up to 12.3 inches in shell diameter. 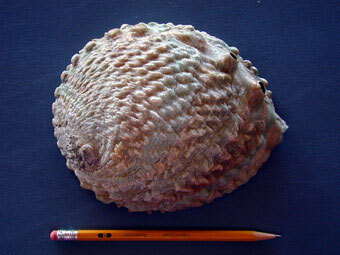 This was the main species that was harvested in the California abalone fishery – which no longer exists. It is also the species upon which most of the mariculture interest has been focused both by public and private groups. 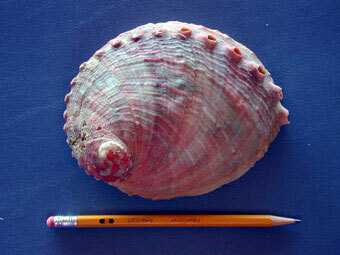 Pink abalone, Haliotis corrugata, have a highly corrugated shell margin. Because of this they have an alternate name, the corrugated abalone. 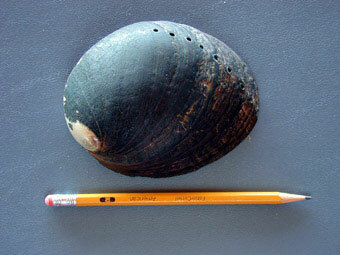 Black abalone, Haliotis cracherodii, rarely have anything growing on the shell and are often intertidal. Adults have a wide tolerance for various temperatures. 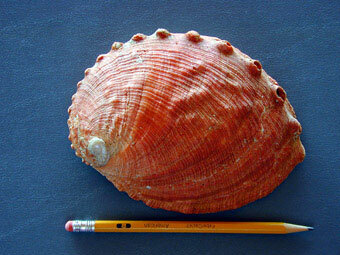 This species was the least desired of the North American abalone for food. They are a little tougher and lack the pure white solid part of their meat. With the removal of the sea otter (a major predator on abalone) in southern California during the early 1900s this species could be found stacked on top of each other in the tidepools of southern California until hard hit by disease in the 1980s. 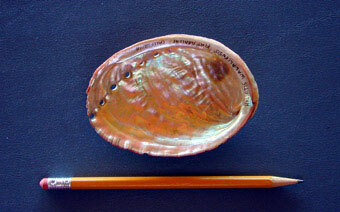 Green abalone, Haliotis fulgens, are restricted to southern Califonia and Baja Mexico. Its interior is prized by jewelers for its beautiful blue-green luster. 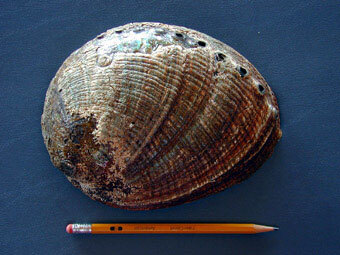 White abalone, Haliotis sorenseni, may have the smallest population on the West Coast of North America. It has one of the most tender and flavorful meats of all the abalone species. Currently this species is being maricultured for seed to be placed in the ocean in hopes of bringing this species back to safe population levels. 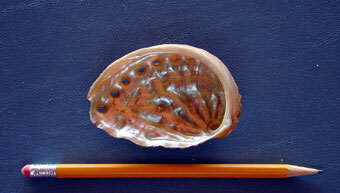 Pinto abalone, northern form, Haliotis kamtschatkana, are one of the more northern abalone. 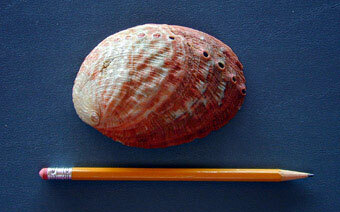 They have a relatively thin shell and were rarely fished due to their smallish size. NOTE: Threaded abalone, the southern form, were once regarded as a subspecies of the pinto abalone and given the name Haliotis kamtschatkana assimilus while the pinto abalone was Haliotis kamtschatkana kamtschatkana. 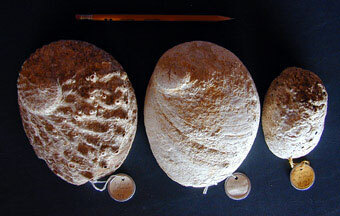 However, genetic studies in 2005 and 2010 found their tissue to be molecularly identical so they are considered one species, the pinto abalone, with northern and southern shell characteristics. 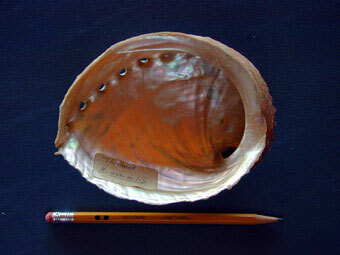 Flat abalone, Haliotis walallensis, have a flat shell and are often located in the far reaches of cracks and crevices making them difficult to see. They prefer cooler water than many of the other species and thus are a more northern species. This species is rarely collected for food as it is relatively small. 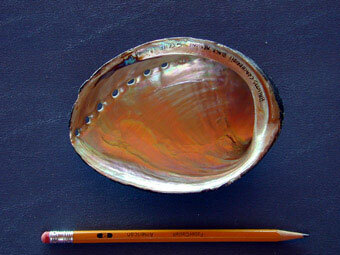 NOTE THAT THE PINTO AND THREADED ABALONE ARE NOW CONSIDERED ONE SPECIES = PINTO ABALONE. Several characteristics can be used to tell the seven abalone species apart. 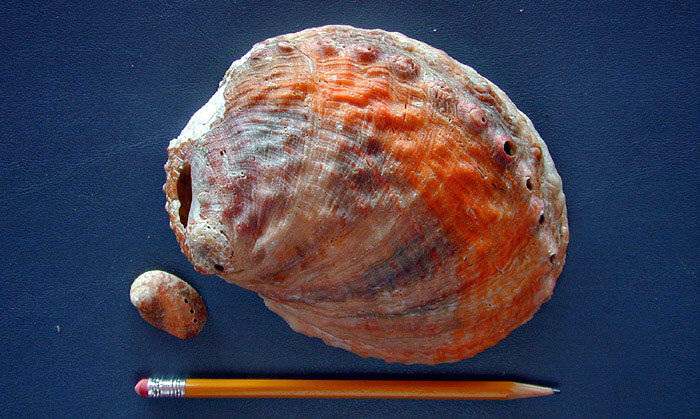 These include the number of open holes, the color of the outside and inside of the shell, the shape of the shell margin, the presence or absence of a muscle scar, the color and description of the epipodium, and the color of the epipodial tentacles. 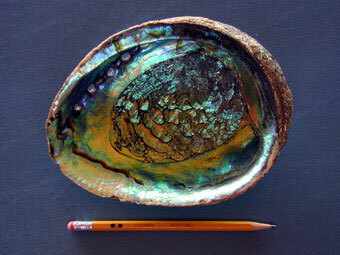 Abalone species live in temperate areas all over the world. 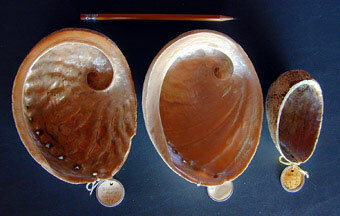 They share similar shell and body characteristics but each species is unique. Somewhere over 80 species exist worldwide – all found in rocky habitats. 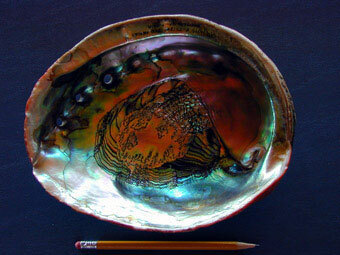 Most abalone can be used to make inlay jewelry because of the beautiful mother-of-pearl inside the shell.